The long announced IPO of marketplace lender Lending Club is imminent now, with the first day of trading expected to be around Dec. 10th. 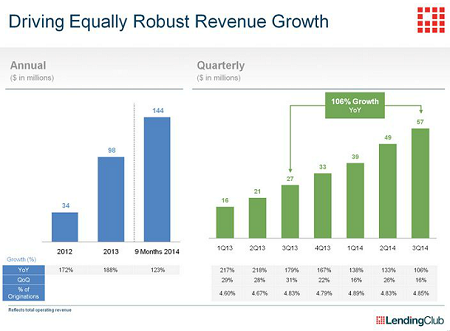 Lending Club will issue 57.7 million new shares priced in the range of 10 to 12 US$. On the upper end this means the company will have a valuation of around 4.4 billion US$. At the same time existing shareholders will offer 7.7 million new share for sale. 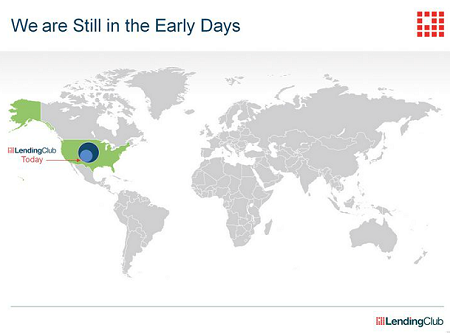 Lending Club did not forget it roots. 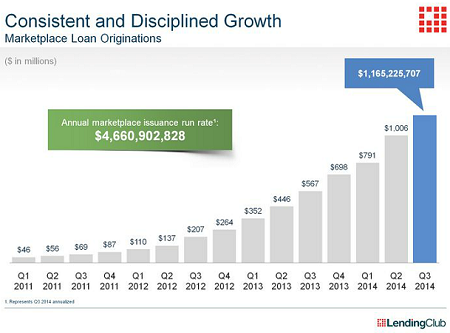 At the begin of the astonishing growth curve it were the small retail investors that funded all the Lending Club loans. So now Lending Club has reserved 10% of the new shares and offered them to these retail investors through a ‘Directed Share Programs’ via Fidelity Investments. For each investor a certain amount of shares (mostly 350) was reserved and offered. 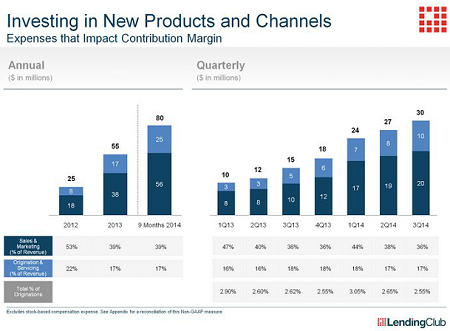 Lending Club showed strong growth every quarter. 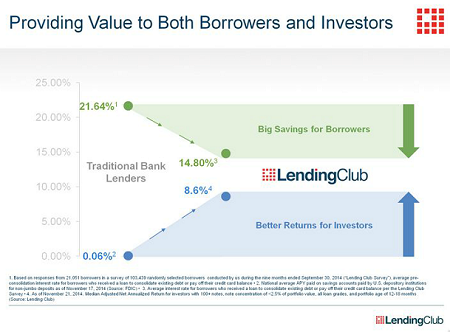 Lending Club has considerable cost advantages compared to banks. 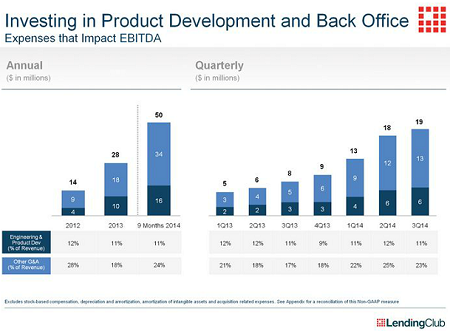 Mainly through leaner processes. 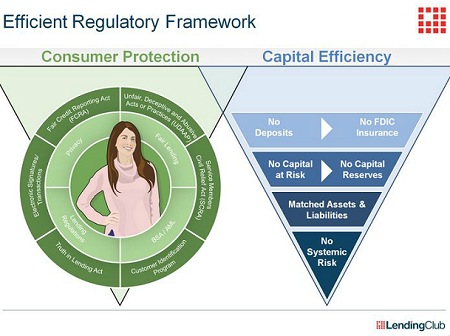 But also there are no reserve requirements as Lending Club does not issue loans with own capital and does not transform loan terms. 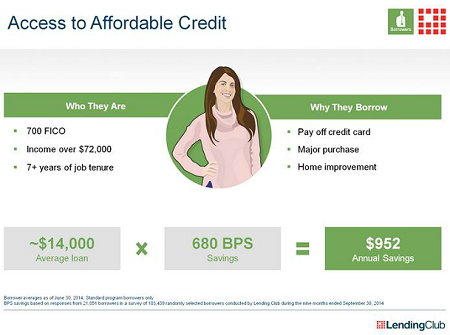 These cost advantages allow Lending Club to operate with a much lower spread, thereby offering higher interest rates to lenders and lower interest rates to consumers. Growth is far from reaching any upper limits. 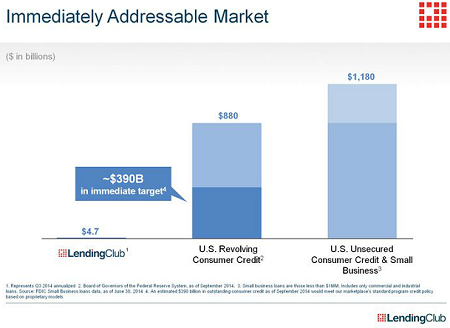 The US Unsecured Consumer Credit and SME Loan Market is 1,180 billion US$. Mid-term the potential target market is even bigger. And thats not considering the opportunities for international expansion. 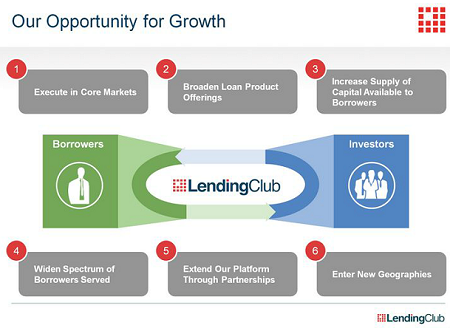 Lending Club borrowers are attracted by the transparent, fast and ‘fair’ process and the lower interest rates. 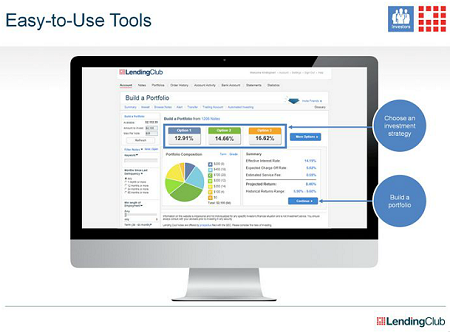 Lending Club offers fixed monthly rates, no hidden fees and the opportunity to prepay at any time at extra no fee. Retail investors are attracted by high returns, transparency and easy to use tools. 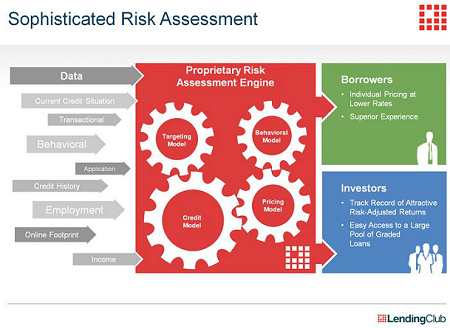 Lending Club optimised risk assessment. 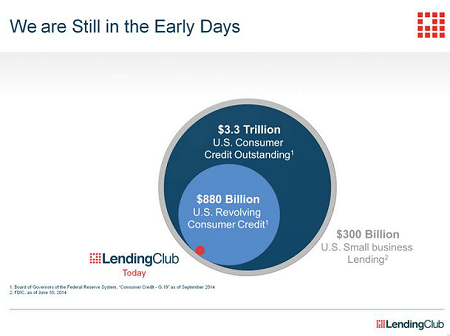 Lending Club is by far the largest p2p lending service. 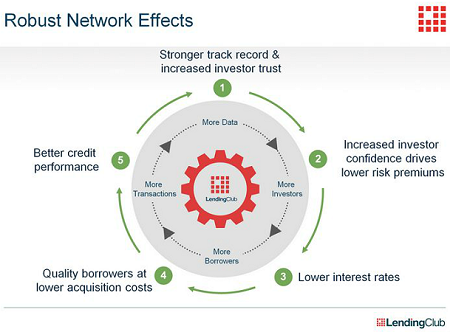 Network effects will further enhance the advantages over time. 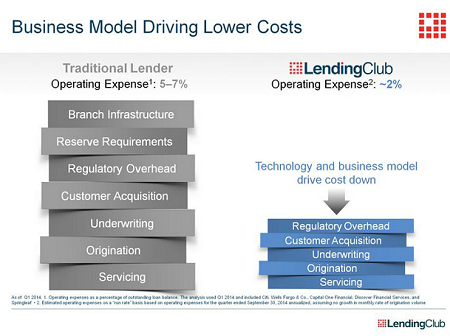 93% of revenues of Lending Club are from loan origination fees, the borrowers pay. The remainder is servicing fees charged to lenders. Revenues equal 4,8% of loan origination amounts. Cost: product development/ engineering vs. supporting units (e.g. legal, finance, accounting, support). Lending Club wird mit dem neu aufgenommen Geld neue Produkte entwickeln, neue Marktsegmente erschließen, ggf. durch Eingehen neuer Partnerschaften und auch geographische neue Märkte angehen.